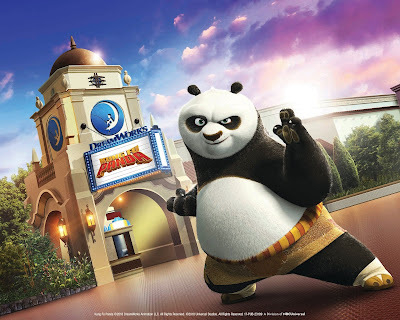 Celebrate the year of the dog at Universal Studios Hollywood with Dreamwork's Kung Fu Panda characters and some new activities, food and shows. Along with all the fun attractions Universal has year round, a Lunar New Year celebration area inspired by Kung Fu Panda is available with the Dragon Warrior Training Show at the all-new Jade Palace Performance Stage, being taught how to draw your favorite Kung Fu Panda characters, Mr. Ping’s Noodle Shop with an opportunity to speak with and take a photo with Mr. Ping, even the Despicable Me Minions join in traditional Lunar New Year attire and Mandarin-speaking MEGATRON from the Transformers franchise is there to interact with guests. The interactive martial arts demonstration Dragon Warrior Training Show performed by Master Po and friends is fun for all ages. Its a fun quick show that is a like being in the Kung Fu Panda movies. After the show Po and Tigress are available for photo opportunities. The drawing demonstration is led by professional animators who explain how to draw the characters in the easiest way possible. Paper and pencil are passed out for those who want to have a souvenir to take home. Mr. Ping is available to meet and take photos with guests and the Special Ingredient Stir Fry – with beef, chicken, tofu or Shrimp – is available for purchase along with other chinese food at Mr. Ping's Noodle Shop. The wait time for the food wasn't long at all. The prices were decent and was enough food to feed a single person. The stir fry was good, but was a bit sweet. There was only chopsticks, from what looked to be available, so knowing how to eat with chopsticks is definitely a plus. The photo opportunities with the minion and Megatron can get a long line, but with assistance from the attendants there the lines move quickly. The area can be enjoyed in as quickly as an hour and then the rest of the park and rides are there for the rest of the day, or enjoy some food from Mr. Ping's Noodle House at night and relax for the rest of the day with the Lunar New Year's celebration activities. Click here to get more information on the Lunar New Year Celebration.